Every year over 25 groups and 100 regional, national and international musicians treat thousands of concertgoers to their music for free at the Plaza del Sol, playing a wide variety of genres, rhythms and traditions. 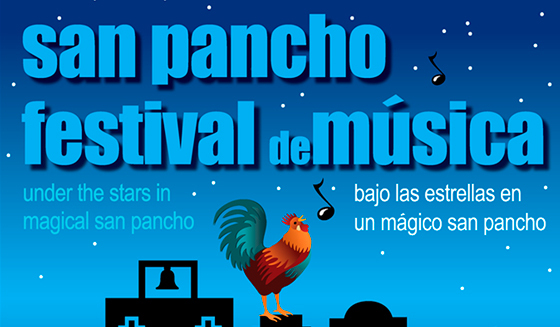 Everything’s ready for another year of fun at the 17th San Pancho Music Festival, which will take place on Friday, February 26, 2017, at the Plaza del Sol in San Francisco, the Riviera Nayarit’s Cultural Capital. The three days of the festival all begin at 5 p.m. and end around midnight. The music will be played on two stages for continuity, while the concertgoers can enjoy food and drink from restaurant booths set up in the area. There will be tables and chairs set up for those who arrive early, but as experience has shown, those who can take their own chairs should because they will fill up quickly. This festival began in 2001 in a town resident’s yard, and it’s been thanks to the quality and the generosity of the musicians, as well as donations, sponsorships and volunteers, that the event has today become one of the most important events in the region. This is a non-profit festival, all donations are tax deductible. In order to support the cause and get the deduction, please execute the transaction online via the Chacala Cultural Foundation at http://www.chacalaculturalfoundation.org.